How and why communities in Nairobi’s informal settlements are creating and using maps to ensure their food and the people who sell it are safe. 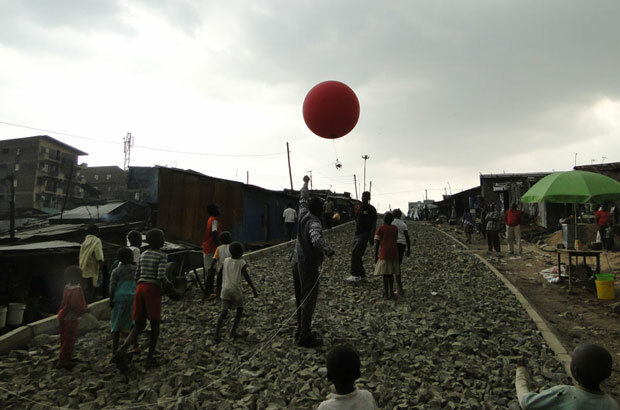 As part of a mapping project led by community members and Muungano wa Wanavijiji, a federation of Kenyan slum-dwellers’ associations with support from partners in the Urban Zoo project, a camera held aloft on a big red ballon maps food kiosks, mobile street vendors and things such as dumps and open sewage in order to improve food safety. Before mapping began, Muungano organised focus groups so community members could discusse what to map, where, and how. It was deliberative, open, and unrushed and local people collaborated to define their geographical and social boundaries and decide how they want to describe their space and what story they want to tell. Unlike Google maps, which don’t have the resolution to help with informal settlement mapping, low-cost tools such as balloons, kites and drones produce up-to-date aerial images of parts of the city official maps do not cover. These balloons were used to map where food vendors operate and the hazards they face in their daily work.